EXPERIMENTS IN CONNECTION: YOU & I – PF18 Interview! We were looking to perform outside of the South East, and PortFringe had a reputation for interested fans and curious art makers….so we thought it was the kind of place we would want to hang out for the summer! The show was created out of my personal experience and research into human connection….because for awhile I wasn’t very good at it. At a rather lonely place in my life I hit reset and asked what it would take for me to make genuine connections. It turns out it takes a commitment to seeing others and appreciating the gold in everyone you meet (you), and then becoming confident in exposing the honest self (I). The individuals you meet along the way tell you just as much about you, as they do about themselves. Abstracting this discovery into contemporary dance became natural because dance is already so intimate. I linked together these ideas and presented the first iteration of “Experiments in Connection” at the 2018 Asheville Fringe. This show feels important for the dance community as well as the global community. 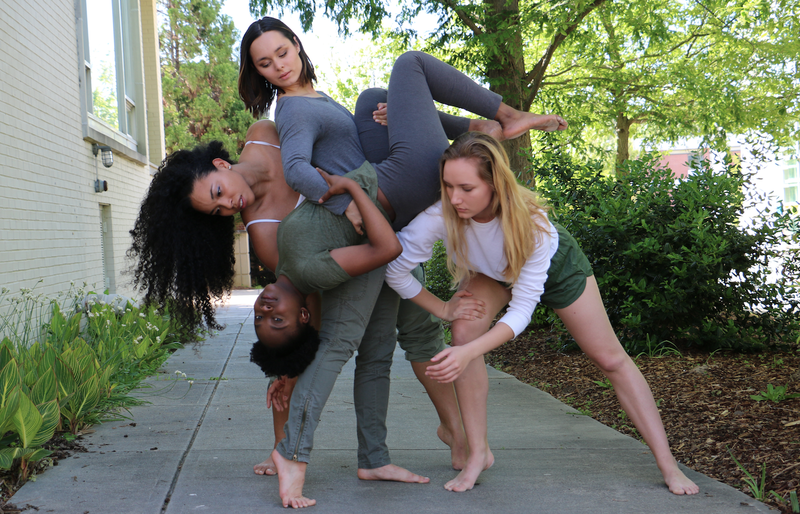 We are presenting many non-traditional ideas about dance – no gimmicks, simple costuming, and a partnering dance with four women. I think we are making a statement for our medium that all bodies, all shapes, and all colors have a right to move and to be regarded as beautiful. For the global community, we feel confident in displaying the “lost art” of seeing one another. In a world of swiping, objectifying, liking, loving, commenting, replying, laughing, mapping, planning, creating, comparing, condemning….genuine connection is a welcomed stillness. To change the world, we must provide alternative solutions, and the real time connections created and held in the time and space of the dance do just that – give the audience an example of feeling truly known – in order to illuminate what we’re really missing. To look up dancing and see Pink (Alecia Beth Moore) in the audience would make my little artist heart sing. Her rebel-like aerial swinging strength is mesmerizing to watch, but her performance slips in a great deal of vulnerability, letting her humanness often become the way others connect with her. I think were doing that in a less extravagant way, but her extravagant eyes on it would be stupid cool. #BODYTALK is right up our alley. As dancers, “making amends” with our body is a daily conversation. I’m excited to witness Groat’s presentation of these ideas in her own unique story-telling medium. We will be there FOR SURE! SEE EXPERIMENTS IN CONNECTION: YOU & I AT PORTFRINGE 2018!